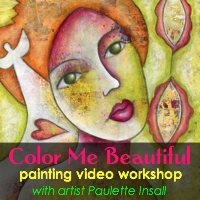 i'm coming out of my self-imposed hermit-dom to make an exciting announcement...my new video workshop "Color Me Beautiful" is ready and finally available for purchase! woo hoo! and that's not all....for the very first time ever, i'm having a workshop giveaway! yep, you read that right. :D and....get ready for this....i'm giving away three copies of my brand new video workshop. not just one, but THREE! ooo and if you want another entry, grab my workshop banner below (just copy and paste the code in the text box below it) and post it on your blog. then come back here and leave another comment with the link to your blog so i can go check it out. Be sure to come back and post a second comment so that you get your additional entry in the contest.